TIME to CLEAN UP, CHURCH! I write this letter with a HEAVY heart and more than 31 years later! Judgment is coming to America and as Scripture says, Judgment first starts in Abba Jehovah’s own house and people. I am an intercessor prophetic journalist and worship leader (ordained by Pentecostal-spirit-filled pastor-elders and have been in Fathers service since 1983) passionate for Father God, Yashuah Jesus and especially to see Holy Spirit move, walk in miracles, healing and repentance- revival. My anguished travailing for America’s fate-destiny and particularly, Christ’s Bride, has led me to deep place in Him. 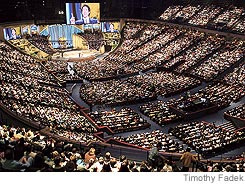 Watching Christian TV and seeing many of the famous TV pastors and evangelists with massive congregations, wouldn’t we expect this many people to heavily holily influence our present society, the media and politics. Would our influence change the ever-contaminated sinfulness of our nation After all, Jesus declared us to be a city on a hill. I came to Christ as a non-practicing Catholic, invited to a small Pentecostal church in Toms River, NJ. A young Jehovah’s witness man wanted to court me, but I felt something wasn’t right with his religion. Father led me to Pentecostalism-spirit-filled life and I was never the same. I found myself transformed in many ways, even though Abba had me endure many fiery trials. Only a year into attending this tiny congregation, (of about 15 adults, 7 children ) our church erupted in a scandal. Our beloved pastor had adultery with 3 of the deaconesses, a homosexual relationship and molested several of the children!! Many of us were so traumatized that we could function for weeks! Many of the new believer left Christ and I watched as their unattended wounds became fodder for atheism and hating all which had to do with Jesus. Somehow I had an inkling that this Jesus I read about and served was nothing like the leaders I sat under. I continued my joyful evangelism in the nursing homes and hospitals. I was hungry for more of my Jesus. I followed two spirit-filled sisters from my former church to a Monmouth county AG. I rejoiced to once again have a family. (My own blood family was ripped apart by child abuse, foster care and divorce). I enjoyed about another year with my new family and enrolled in college where I met a charming guy. I was passionate about Jesus and evangelizing wherever I went. The guy was attracted to holy Spirit’s joy in me and we started to spend time together in God’s word and Bible study. Unbeknownst to me, he had some serious baggage. I ended up courting him (in ignorance about being “unequally yoked) . Fast forward to my second deep spiritual wounding. My fiance’s baggage was involvement in the occult and witchcraft. His salivation prayer and baptism of Holy Spirit at a Terry Talbot concert was not enough to deliver him from satan’s grasp. I was caught in a vicious and deadly fight for my spiritual freedom and life! The shocking thing is that my 60-something AG pastor and his son, (as well as 4 elders and deacons) were unable to cast out a witch-craft-demoniac spirit from my fiance. I was only three years old in my faith and I’d never experienced the hatred , rage and abuse which my fiancé poured on me and from which I couldn’t escape because of his threats to ‘find” me wherever I escaped to and murder me if I didn’t marry him. I ended up being married by this AG pastor. Shockingly, there was no concern nor discernment for my well-being and that they should certainly not endorse a marriage to such a man with such demonic oppression! I can’t tell you what this did for my belief in the “heavenly” Father who is supposed to love and protect me! God help you pastors which have allowed your sheep to be torn and butchered by satan and his demon spirits! I would n’t want to be you when you have to give an account before the GREAT judge Jesus Christ at the bema Seat. Fast forward to the next phase of my growth. I had enough of the shallowness and lack of true Exousia anointing that I so desperately needed as a victim of child abuse and now domestic violence and abandonment-divorce. I met someone who said that Calvary Chapel in Old bridge was a good church. Though hesitant, I decided to go because I needed fellowship and healing from two bad Christian experiences. Because of my giftings in voice and worship, I connected with the worship pastor, (no name). He saw my love for Christ and my talent as a singer-songwriter and encouraged me to sit under Pastor Lloyd’s teachings. Eventually, I could apply to be one of the worship leaders. I won’t apologize for the length of this expose because it’s time the sin in AG and other large churches be exposed. This is why America has declined in her godly heritage. I had to share this grievance, (because of a recent wounding-abuse of a beloved brother and AG pastor). He shared his story with me in confidence. Upon praying about this, ( I shared some fo my abuses) Abba compelled me to share this with the body of Christ. So they see the reality of their sin, guilt and repent. The axe is coming down very soon. Who knows whether Father will grant us grace to partake of the great revival harvest. But…there won’t be any harvest or revival with a church that is filthy with adultery, greed for money, controlling-intimidation weaker sheep, apathy regarding the murder or our unborn babies and the stronghold of Homosexuality in our nation. Brothers and sisters…REPENT and turn from your sin. Ask Holy Spirit if deception has risen as a barrier blocking Holy Spirit’s voice. What is most urgent here is the necessity to bring more souls into His kingdom. Satan’s MO has surely been to use Father’s pastors and leaders to bar people from getting into the kingdom. Getting back to Calvary, Old bridge, a few months later, this worship pastor seemed to ignore me anytime I asked about leading worship. I was puzzled at his change of attitude towards me, but was patient. A few weeks later after not seeing him on stage with the worship team, I asked someone what happened to pastor. They told me he was ousted for having an affair with one of the female worship leaders! So much for Calvary Chapel, Old bridge. (BTW, they do not believe in the heavenly Holy Spirit language or prophetic giftings) . I was again devastated and disgusted. I was desperate for fellowship and like-minded believers to sing and evangelize with. I shared my experience with a sister from our former AG congregation and she told me she was attending another AG in another Monmouth county town. It was great to be back with some of my former sisters. The new pastor and his wife were flowing in the true gifts of the Holy Spirit. I met a wonderful Christian man and was married by this pastor. Then he had to leave about eight months later and another pastor cane. At first, he seemed genuinely led by Holy Spirit. I had to start all over with proving myself as a worship leader and waited for Holy Spirit to reveal my calling to this pastor. I sought Abba’s presence more and more and Father answered my prayer for Holy Spirit to used my gift as worship leader for the edifying of that body. Several times, I during my leading of worship, (and seeing people’s hearts being moved) that this pastor often would interrupt or quench Holy Spirit’s presence. I felt Holy Spirit being “grieved” and shared my concerns with other worship leaders and elders. They noticed also and were upset. This particular church desperate needed Holy Spirit’s ministry because there was mcuh apathy and lack of discernment, members enslaved to depression and even demonic spirits coming in through its own members! This was a very sick church and there would be no transformation or healing with sin in the camp! Another sick episode in this church happened with another pastor, (who is now my present pastor, a highly anointed and spirit-filled women of God) The pastor at AG gave permission for her to have a worship service there and upon arriving she saw in t before she could even enter, she had to rebuke and break yokes of demons that were around this AG church!! I was quite surprised when she confided in me. I’ve heard too many horror stories about Kundalini spirits and AG people not having the real Holy Spirit. The last straw on my back regarding these lukewarm and soon-to-be-judged churches is my dear pastor friend who was ousted for confronting adultery (adultery seems to be a favorite sin and rampant in these churches including AG churches). I met this precious and true man of God through the former-mentioned pastor at the AG church where I led worship. He was convicted by my true anointing and tried to get rid of me by offering me to this pastor friend of mine who was staring a new church in Ocean county. (No names). Strangely, the church didn’t take off and a year later had to be closed. My pastor friend then took a position at another very large AG church in Ocean county. He was there a while but then a problem arose with the senior pastor having an affair with another woman My pastor friend confronted the leadership about this. He also reported them to AG headquarters. My pastor friend’s wife suddenly died and rather than the leadership of this church supporting him through his loss, he was rebuked, snubbed. (and now black-balled)!!! I am ( but even more so Jehovah, Yashuah Jesus and Holy Spirit) sick of this evil and sick of all the sin in God’s house. I share this with the AG leadership ( and every church who proclaims Christ as Lord and King of the world) as Holy Spirit leads me so that there can be repentance and healing in the Body of Christ. Yashuah seeks a church without spot or wrinkle and if anyone thinks that He ignores these transgressions, they are very mistaken. I urge you all to repent. My physical body has been severely damaged by all the demonic attacks and trauma while being a part of a Pentecostal-evangelistic AG environment. I still am paying dearly with a neurological condition called Dystonia, no doubt by all this evil and trying to oppose countless and relentless satanic attacks because I desire God’s presence and Holiness MORE than anything in this world, (as well as my pastor friend who I’m helping to strengthen and heal)..
BTW, what ever happened to giving a public apology to the body and to all people? Please do not ignore this letter or retaliate by unbelief, apathy, or black-balling saints who desire Abba’s presence and desire to be holy. . Christ is coming VERY soon and we’ better repent NOW, clean up our acts and be ready to prepare ourselves as Jesus Yashuah’s virgin bride. Amen and amen!